As the world around us evolves, product innovation and upgraded technology is a natural progression seen everyday. In the early days of civilzation people had to wash their clothes by hand, then came the scrub board, then in the 1930's the washing machine came along. Since then, there have been many upgrades and remodels of the machine. But recently, the high efficiency washer was invented; which is less noisy and much more cost and energy efficient than normal washing machines. Our HT™ crystal is the high efficiency washer of crystals. In quartz crystal monitoring processes that operate up to 500 degrees C, regular AT cut crystals are very noisy, and not to mention will fail fairly quickly because of the high temperatures. 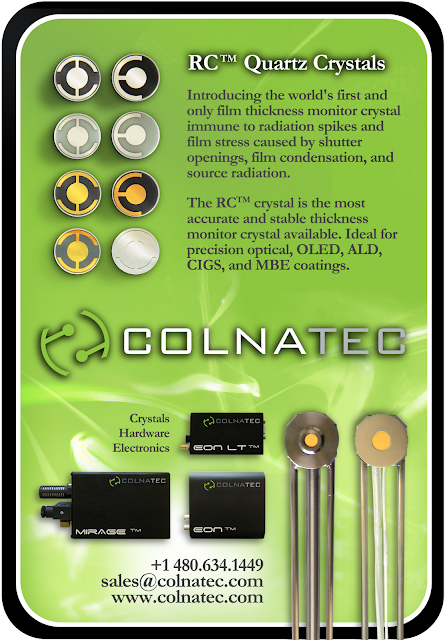 To combat these issues, Colnatec invented the HT™ crystal that excels where the standard AT cut crystal fails. The HT™ cut crystal is stress insensitive and can operate stably up to 500 degrees C, this eliminates the noise rate which prevents inaccurate readings. The HT™ crystal was designed to be used in our Tempe™ system for very high temperature applications. The major benefit of using our HT™ crystal with such high temperature processes is that it can be regenerated, therefore allowing it to be used an infinite number of times. With the HT™ being able to withstand much higher temperatures, customers will save time and money by reducing overall crystal failure. With Colnatec's HT™ crystal you will have a less noisy more efficient crystal which leads to a much more consistently accurate process. As always, please contact sales@colnatec.com for more information on our HT™ crystal or any of our other products. Check back soon to learn about our revolutionary Tempe™ sensor head. Colnatec is making huge strides in growing our business, we have just finalized our first print advertisment to be featured in the Society of Vacuum Coaters (SVC) Bulletin publishing in the upcoming weeks. Colnatec is now featured on OLED-info.com as a manufacturing equipment provider. OLED-Info.com is the premier source for comprehensive news and updates on this innovative new technology. Check out Colnatec's feature here.